Copyright 2002 by the Tarvin Family Association. Permission to reproduce is granted provided proper attribution is made. 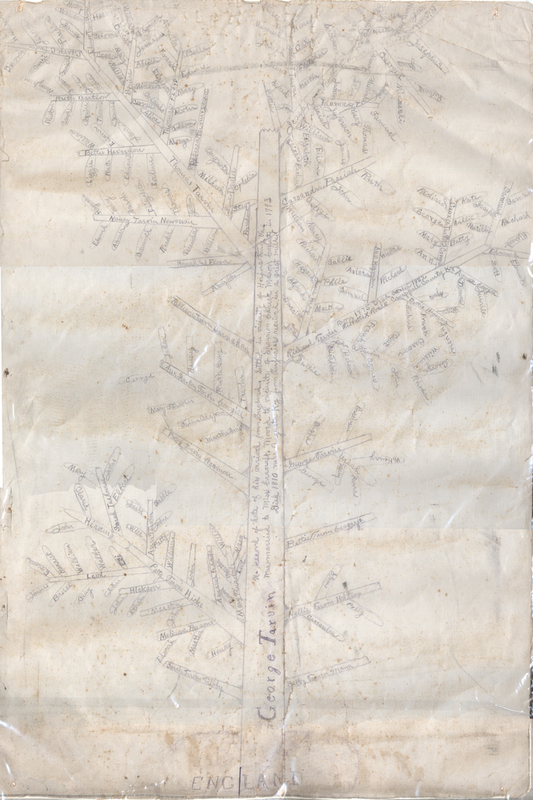 Early efforts to record Tarvin genealogy took the form of drawings of a "Tarvin Family Tree." The first such drawing of the Rev. George line was made by Richard J. Tarvin in 1897. The original of this drawing is being located. 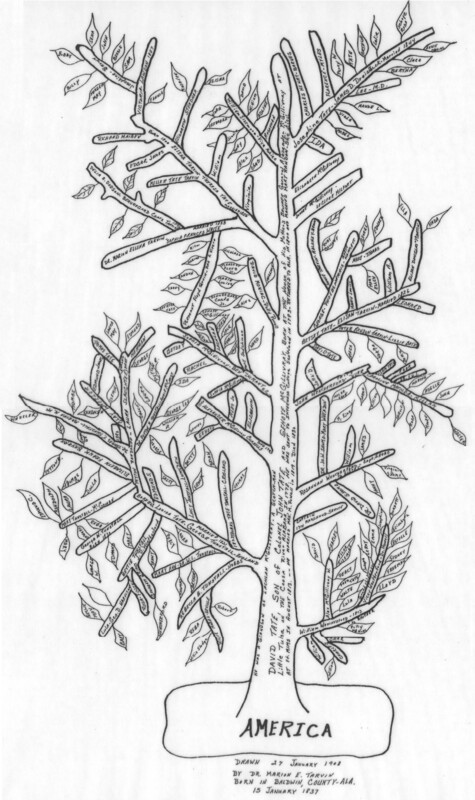 A replica of this drawing in pencil on linen is in the Mason County Historical Society library in Maysville, Kentucky. Meanwhile, Tarvins of Line William documented portions of their family in a similar manner. The genealogical value of the names on these drawings is questionable. No source records are indicated and many names are incorrect, misspelled, or illegible. Their main value is as family artifacts and historical attempts to "picture" the spreading Tarvin family. Family members have brought copies of these drawings to reunions over the years and shared them with relatives. We've scanned several of these copies for the web site. These thumb-nail size versions give you some idean of what the trees look like. Full-size scan files in JPEG format are available to download. To make them readable, some of them are quite large. Rather than wait for them to slowly load in your browser, download these files first to your hard drive, then open them with a picture viewer or web browser. To download: DO NOT Double-click on these picture links. Instead, right-click on the link (Mac users, Control-click) and select "Download link to Disk." Save the file in a handy place on your hard drive. To view after downloading: Start a web browser or picture editing program. Then from the File menu, select "Open file" and find the file you just downloaded. 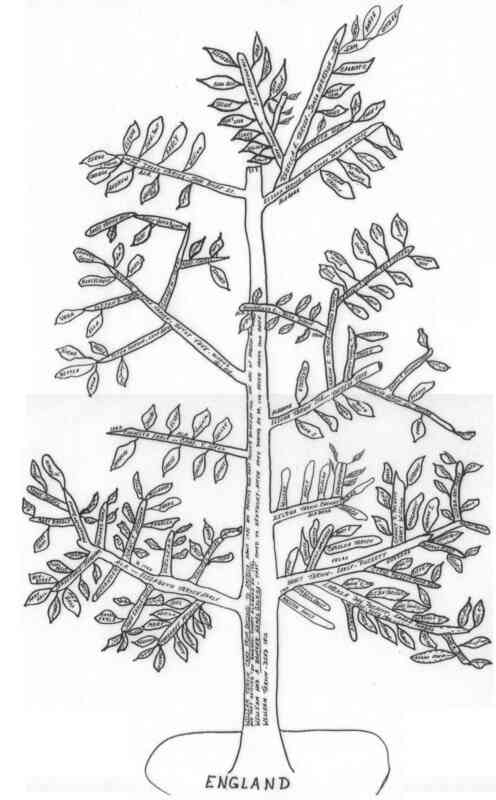 Tarvin Family Tree by Richard J. Tarvin, 1897. Approximately 15 in. wide by 24 in. high. Scanned file is 2 MByte. Right-click to download large picture file. Size: 2 Mb. Replica of Tarvin Family Tree. Pencil on linen. Holding of Mason County Historical Society. Photographed by The Photo Shoppe, Maysville, Kentucky. Photo reproduction is 20 in. by 30 in. Size: 600 Kb. 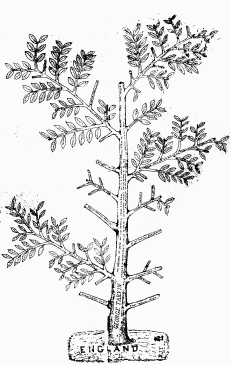 William Tarvin Tree. No colophon on our copy, but style similar to David Tate Tree. Scanned copy is 9 in. by 15 in. Size: 600 Kb. 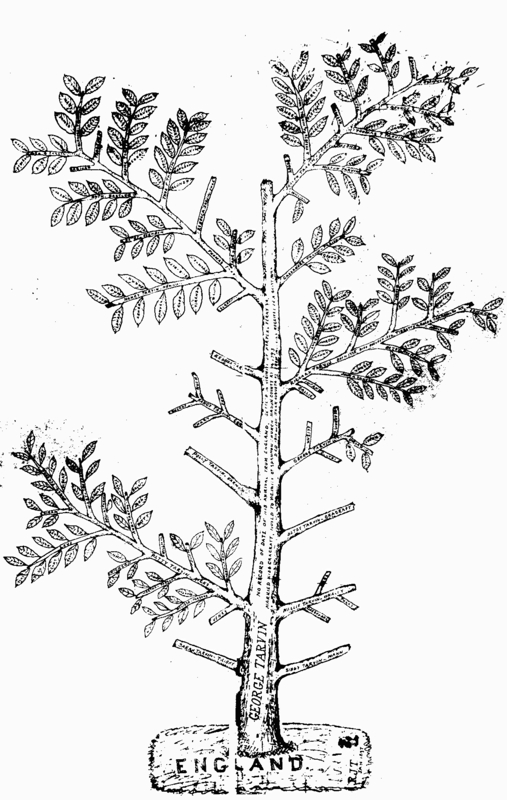 David Tate Tree by Dr. Marion E. Tarvin, dated 27 January 1908. Scanned copy is 9 in. by 15 in. MacDonald & Allison Family Tree. Showing descent from the Thoroughgoods, Fowkes, Dents, Tarvins, Nobles, and Bradfords. Original size is 30 by 60 inches. Scan courtesy of Dan Phillips.